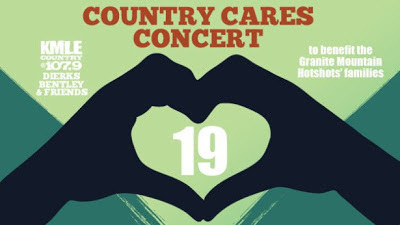 Phoenix native Dierks Bentley will headline KMLE/Phoenix's and KAFF/Flagstaff, AZ's Country Cares Concert benefiting the families of the 19 firefighters who died while battling the recent Arizona wildfires. Proceeds from the July 22 show at Tim's Toyota Center in Prescott Valley will go to the United Phoenix Firefighters, who will distribute them directly to the families. "We hope this benefit concert gives everyone affected by this tragedy the opportunity to come together and heal," says KMLE PD Tim Richards. "We want to raise as much money as possible to help the families of these amazing heroes." Tickets go on sale here and here Friday (7/12).